A little off the beaten track but no less superb for it, these rides are as rich in tone and colour as their appearances. They're not cheap, but instruments with this much character justify the outlay. No two cymbals the same. Well-defined tones. These new Meinl Byzance Vintage Pure and Pure Light Rides have been developed with input from German jazzmeister and brush specialist Florian Alexandru-Zorn. Available in two diameters, 20" & 22", they are, says Meinl the 'next level of dry' and are recommended for multiple styles of music. Probably the closest term that could be used to describe the cymbals' timeworn appearance is organic; they look as though they have been prised from deep below the earth's crust, having spent millennia in formation. Of course the truth is far more prosaic and the looks are deliberate; such a strong visual statement indicates an equally unambiguous sound palette. "Individually cast from B20 bronze and then hand-hammered, the cymbals are left completely raw"
Though a thoroughly modern company, Meinl has a facility in Turkey where all Byzance cymbals are made using traditional cymbalsmithery methods. 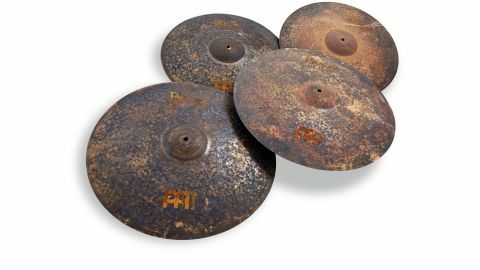 Individually cast from B20 bronze and then hand-hammered, the cymbals are left completely raw with evidence of the manufacturing processes left permanently on show. Amongst the abstract impressionism-like medley of splatters, swirls and trails, the Meinl logos aren't easy to pick out, appearing partially submerged by the detritus. You'd imagine that touching the cymbals would result in a film of oxide being transferred to your fingers but oddly enough this doesn't happen - German cleanliness and efficiency seems to have intervened in the final finishing. The cymbals share gently tapering profiles and moderately sized bells, are peppered with hammer marks but are lathe-free. Though the amount of hand-working required guarantees that no two cymbals will be identical, the two medium weight Pure Rides are darker in overall hue than the medium-thin Pure Light rides. Each cymbal also has its weight in grams hand inked underneath the bell. The difference between the two 20" rides is a fraction under 300 grams whilst the pair of 22" models is separated by just over 350 grams. We set up the Pure Ride combo as a pair with the 22" being the main ride while the 20" model occupies the left-hand side. The absence of lathing and polishing does nothing to dull the cymbals' response; if anything it's the opposite, as the stick sound is honed and distinct. Dry, yes, but not lacking in definition. The feel is intimate and direct, with nothing coming between each contact stroke and the response; what you see is what you hear (kind of). The smaller diameter cymbal is higher in pitch with brighter overtones and the stick sound is tighter, while the 22" ride is lower and slightly more expansive with darker eddies swirling beneath each sticking. A bank of earthy wash accompanies any patterns but the dry nature of the cymbals ensures that it remains a background colour rather than a key feature. When crashed they open with a long deep rumble not unlike a drawn out peal of summer thunder. While cut and projection may be in short supply, depth and complexity is amply catered for. The cymbals work well together and between them provide a high degree of articulation and expression - they're definitely on the jazz spectrum, but not exclusively so. Being thinner, the Pure light rides are darker still and a fraction looser overall in feel. The stick sound is more of a breathy 'tah', particularly on the 22". Beneath it the wash is more animated. Both cymbals open with ease when crashed, providing pulse-quickening surges in volume rather than tonality before slipping back to normality. And if the edge wobble of the Pure Rides is suggestive then the way the Pure Lights dance is the cymbal equivalent of twerking.